Anyone who has taken a drive through this area will tell you that we New Englanders love our ice cream. Whether you're traveling down a main street or cruising through a heavily wooded area, you're never more than 20 miles from an ice cream stand. Some of these places are only open during the summer months. However, there are a few that stay open year round for those freaks (like us) who enjoy eating ice cream in frigid weather. Uncle Ed's Front Porch is one of those places. After reading rave reviews about Ed's delicious homemade ice cream on the Internet, we decided to take a ride to Rehoboth to check it out. We pulled into the parking area at 5 p.m. The first thing Mom and I noticed was how cute the place was. It didn't even look like a stand; it looked more like someone's home. 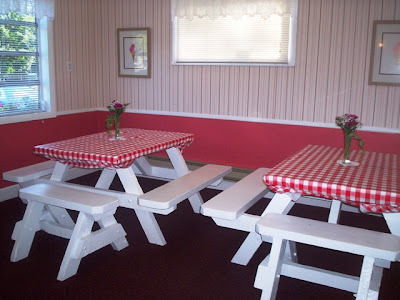 Although the parking lot and building are small, there are a few picnic tables located on the side of the building so that customers can enjoy their treats outside. Stepping up into the ice cream parlor, Mom and I figured out how Uncle Ed's Front Porch got its name. 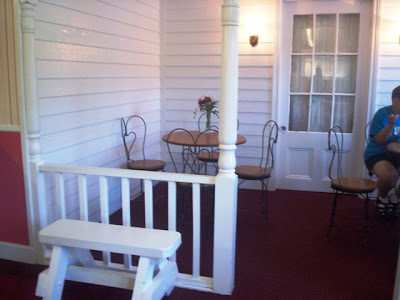 One complete side of the dining area was set up to look exactly like someone's porch with two round tables on each side. The walls were covered in vinyl siding, and there was even a door and "porch" lights. All this was set behind a trellis with a lace curtain running across the top. On the other side of the room - set against a pretty red and white striped wall - were two large picnic tables covered in gingham tablecloths. The interior was immaculate and we both thought that the design was absolutely adorable. We took our cups outside and decided to eat in the car. Mom's gingersnap molasses ice cream was very unique. She said that she'd never tasted anything like it before. 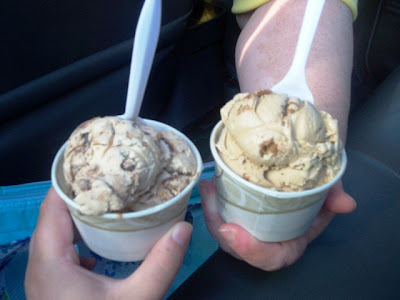 It was deliciously smooth and creamy, except for the crumbled pieces of gingersnaps set inside the deep molasses base. It was so different and delicious that she would definitely recommend it and can't wait to have it again. My peanut butter fantasy was surprisingly creamy as well. The ice cream was peanut butter flavored and had a fudge swirl with several broken up pieces of peanut butter cups mixed in. It was full of flavor and not overly sweet. I really enjoyed it. 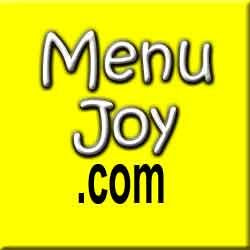 When I got home and uploaded the photo I had taken of the menu, I was a bit disappointed that it wasn't that legible. Uncle Ed's Front Porch has some really unique flavors including frozen pudding, Baileys Irish Cream, Grapenut, ginger, cashew caramel turtle, cookie dough, Oreo, blue dino, Almond Joy, cotton candy, mocha mud pie, cherry chip, pistachio, maple walnut, and the requisite vanilla, chocolate, coffee, and strawberry. 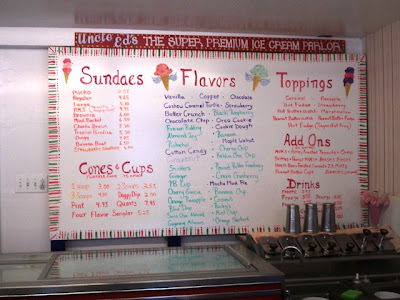 The prices are pretty good, ranging from a $3 small cup or cone to a $7.95 quart of ice cream. Uncle Ed's also offers several different types of sundaes and drinks with plenty of add-ons to make each treat as unique as you like. Mom had read somewhere online that the owner even takes suggestions for ice cream flavors, and if you're lucky, he will make a batch of your crazy concoction. 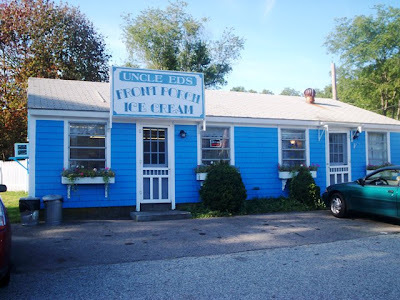 Because of the great service, adorable building, and fantastic ice cream, Mom and I were ready to give Uncle Ed's a score of excellent (a.k.a., five hearts). Instead, we decided to give it a score of very good (four hearts) because we've only been once. I'm pretty positive that Mom and I will be heading back in the very near future, and we're dying to try several more delicious flavors. Uncle Ed's Front Porch just may have become our new favorite. Uncle Ed's Front Porch is open daily from 1-9:30 p.m. year round.